Cat spraying behavior can throw quite a wrench into an otherwise beautiful relationship. Figuring out why your cat is spraying is the first step to ending this unpleasant habit. You walk into a room and your senses are immediately assaulted by the strong odor of cat urine. There's no litter box to account for the fumes, and no obvious puddle on the floor indicating a house accident. When you finally locate the source of the smell, what you find looks more like a squirt gun accident, as though the urine had been sprayed directly at the wall, or even worse, your furniture. In fact, this is exactly what has happened, except that your cat has done the spraying him/herself. Let's take this opportunity to dispel a common misconception. Males aren't the only gender that practices cat spraying behavior. Females spray too, and both sexes do it for many of the same reasons. So, the question begs: what can you do about your cat spraying? Here are a few solutions. The first step in eliminating spraying behavior is to find out whether there's a medical/physical problem behind it. Abnormalities in the urethra and kidney stones can cause urine to spray out with a force rather than flow unobstructed. The problem may require medication or surgery to correct the situation, depending on the diagnosis. Both territorial and sexual spraying can be addressed by eliminating the hormone drives that spur the behavior. Spaying is a surgical procedure that completely removes a female's uterus and ovaries. This ends the cycle of coming in and out of season, so your cat won't feel such a great urge to advertise her readiness by spraying her scent all over her surroundings. Neutering involves disconnecting a male cat's vas deferens, or completely removing the testicles. The result is the same as a spaying; the urge to mark and seek mating is removed, as well as the drive to spray. Although figuring out the cause of your cat's spraying is very important to preventing it, you still need to address the mess. Unless you find the location of the spraying and thoroughly clean it away, your pet will be repeatedly drawn back to the spot, turning what was perhaps a one-time incident into habitual cat spraying behavior. Following your nose sometimes reveals soiled areas you can obviously see, such as on white drapes or a sticky window or wall, but other sprayed areas can be harder to see. Shining a black light around a darkened room will highlight areas containing cat urine, helping you locate every spot that needs to be cleaned and neutralized. Once you find the spot, you need to use a cleaning solution that will do more than mask the problem. Both baking soda and white vinegar work very well to neutralize urine crystals, and this is the key to keeping the smell from coming back and acting as a calling card for your pet. Mix white vinegar and warm water in a one to one ratio, then thoroughly saturate and/or scrub the soiled area. Mix a heavy concentration of baking soda with one cup of warm water. Scrub the area thoroughly. Allow either of these mixtures to remain on the area about thirty minutes for the greatest effect, then rinse and blot. Routine litter box cleaning is also extremely important to addressing the problem. A box full of dirty litter and leavings is a place most cats would rather avoid, and they may choose to express their unhappiness with the situation by spraying, puddling and pooping in other areas of the home. It's good practice to scoop the litter on a daily basis, and completely change the litter and wash the box at least once a week. Spraying behavior is a problem best nipped in the bud before it becomes a habitual behavior you may never fully eliminate. Schedule regular veterinary checkups to monitor your pet's overall health. 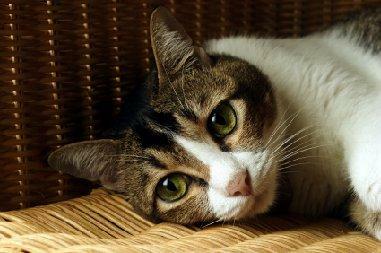 Watch for situations that cause your cat to stress out and try to eliminate them if at all possible. Keep everything clean and give your cat a clear signal where it's permissable to relieve him/herself. Follow these suggestions and perhaps spraying will never become a problem in your home. Dog Urine Cleaners- More cleaning suggestions at LoveToKnow Dogs.